Three features separate the Garmin Forerunner 225 from the recent flood of smartwatches released. It stays true to Garmin’s history by featuring in-built GPS. Go for a run without a smartphone and it will still log the route. The second pertains to battery life. The smartwatch’s round display is smaller and lower in resolution than most. Doing so makes it possible for the Forerunner 225 to last without charge for a month, or for a week if the GPS and heart monitor are used. Rounding off the smartwatches notable feature-set is a resistance to water 50 metres deep. A first for Garmin is the incorporation of a heart sensor into the smartwatche's underside. It measures heart rates from wrists by “shining light into a user’s skin and measuring the amount of light returned”. A light seal on the back of the watch keeps out ambient light for an accurate reading. The Forerunner 225 has an aesthetic graphical interface. A gauge changes colour to communicate at a glance the intensity of a workout. It starts off as grey in the warm up zone, progresses to green during aerobic activity and will climb to red once in the maximum zone. The smartwatch can be used for indoor workouts and will calculate data including steps, distance and burned calories. Workout histories can be uploaded to a smartphone running the companion app, while wearing it at night will provide an overview of sleeping patterns. 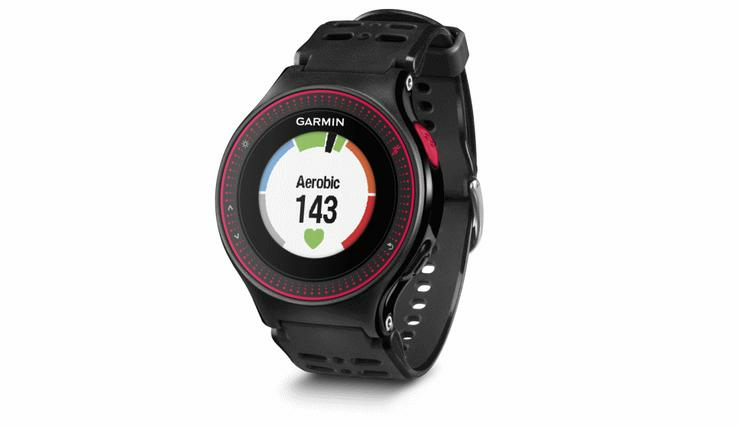 Garmin will release the Foretrunner 225 in black/red in Australia. The smartwatch will be available in June for $389.